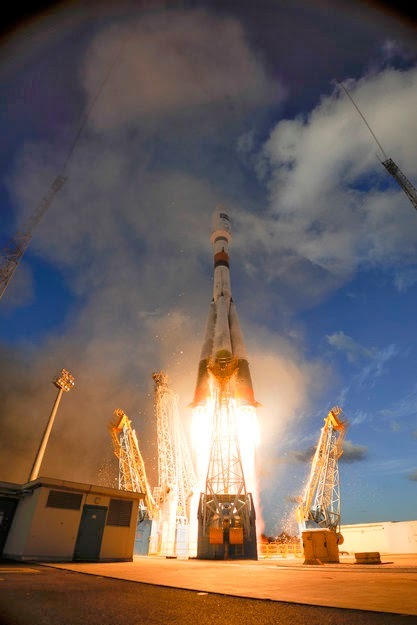 A few hours ago, the Sentinel-1A satellite, the first of the GMES / Copernicus program, blasted of from the Kourou spaceport, French Guiana, on a carrier rocket Soyuz-STA/Fregat. Soon after, the satellite regularly separated from the upper stage of the rocket and started sending signals. A few hours later it started deploying its solar panels. The program originally called Global Monitoring for Environment and Security (GMES) and later Copernicus aims to create an autonomous system of territorial control through a constellation of satellites that have different functions. After the approval of the GMES / Copernicus program last year, the first of the scheduled Sentinel satellite was launched to open a new era in Earth observations from space. The GMES / Copernicus program brings to a new level the observations made in recent decades by the ERS and Envisat satellites to monitor the environment as it has never been done before. From its geostationary orbit at an altitude of about 700km (about 435 miles), the Sentinel-1A satellite will start mapping the territory to have a constantly updated situation of water and soil. Due to the climate changes, it’s more and more important to keep track of changes in glaciers, deserts and coasts but also in woods, forests and farmland. In case of emergencies, which can range from earthquakes to oil spills, it’s essential to have very updated images of the affected area. These problems can be global and it’s for this reason that the GMES / Copernicus program is the European contribution to the international Global Earth Observation System of Systems (GEOSS) initiative. In particular, there’s a collaboration with NASA, which together with the U.S. Geological Survey (USGS) operates the Landsat program, which has basically the same purpose. For its communications, the Sentinel-1A satellite is also equipped with a laser system that will be part of the European Data Relay System (EDRS) infrastructure. Its purpose is to manage a group of satellites in geosynchronous orbit to relay information between them and the ground stations providing full time communications. This system will be extended to satellites in low Earth orbit (LEO) to allow the communication of the ever-increasing amounts of data that satellites collect, too much to be sent via the traditional radio systems. The expected life of the Sentinel-1A satellite is at least 7 years. Next year its twin Sentinel-1B is scheduled to be launched: together, they’ll ensure coverage of the entire planet in just three days. Other types of Sentinel satellites, with various specialized tasks, will follow as well.